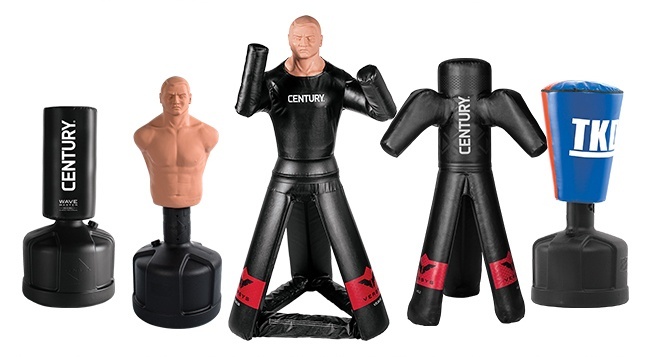 For the last 40 years, Century has been at the forefront of martial arts innovation. One of our best inventions (if we do say so ourselves!) is the freestanding training bag. These days the bags are so ubiquitous you might have seen one without knowing it came from Century. Back in the early 1990s, that certainly wasn’t the case. All training bags used to be hanging. These are great bags. In fact, they’re still popular. But they posed a problem for gym owners whose schools didn’t have the right structure, or those who didn’t want to drill into their ceilings. Bag stands partially alleviate the problem, but they are hard to move and don’t let you work all the way around the bag. But Century’s Research and Development team members are problem solvers. In 1995, we released the world’s first freestanding bag, the Wavemaster®. It was a hit! Today, we offer an entire line of Wavemasters, from the Cardio Wavemaster® to the heavy-duty Wavemaster® 2XL Pro. In 1998, we introduced another game-changer – BOB® the Body Opponent Bag. BOB was the first freestanding training manikin and has also evolved into a line of his own, with the BOB® XL, Bobby Bully and VS. BOB®. Sometimes you need something to slam as well as strike. So Century created the Versys™ line. Check out the versatility of the Versys™ bags here, on our site. Why so many different bags, you ask? The answer is simple. It’s because there are so many different martial arts! And why are there so many different martial arts? That might actually take a book or two to answer. We’ll just stick to covering why the bags are the way they are, and what they’re used for. Taekwondo is a kick-heavy art, so it requires a sturdy bag with a large surface area. The Taekwondo Wavemaster® was built to accommodate. Other bags that are great for taekwondo are the Wavemaster 2XL Pro (the version with scoring zones, if you’re super cool! ), or a hanging heavy bag like the Creed Muay Thai Bag. The 2XL and Creed bags are also great for Muay Thai, another kicking art, as well as karate. What about martial arts that have little, if any, kicking? Judo and Brazilian jiu-jitsu players will both benefit from training using the Versys™ VS.2 bag. Like all the Versys™ items, it is freestanding, but features tripod legs and two hooked arms so you can work throws and takedowns. Unlike a human, it doesn’t complain about being slammed into the mat again and again. It’s perfect for groundwork practice. These are all common sport martial arts. If you’re learning a martial art primarily for self-defense – like Jeet June Do or Krav Maga, the BOB® bag (or BOB® XL or VS.BOB®) is what you want. This manikin bag lets you practice striking a human-shaped target, complete with a scowling face so you won’t feel bad for hitting him. The Torrent T1 and Torrent T2 Pro Bags are one of our newer designs. They’re great for both at-home and at-the-gym training, but they were made to be easily moved on and off the floor. The base can be rolled either way without loosening, so if you need to clear floor space in a hurry, these are the bags for you! There are many great things about getting your bags from Century. One is the variety. Another is knowing you’re supporting an American company. Our headquarters are located in Oklahoma City and employ around 200 Oklahomans, or “Okies,” as the locals say. Our facility includes a warehouse where we make Wavemasters™, BOBs®, and many of the other cool products you get from Century! One of the perks of making our own products on site is that we’re easily able to test them in the real world. Not just your standard quality-control test (although we do that too), but a martial arts quality test. Many people in our company are martial artists. We have two on-site training studios, and during the week, over a dozen classes are taught at lunch and after the work day. Whenever our R&D team has as new product, they bring a prototype to class. Everyone has fun kicking it, punching it, slamming it, and beating up on it as much as possible. If it breaks, R&D takes the prototype back and engineers a way to make the final product better. If it doesn’t break, they make it better anyway, because they thought of some improvements while watching the class work. Century also works alongside professional martial artists when making our products. We send samples of certain new products to John Hackleman’s The Pit gym, where MMA fighters test it out. We’ve also teamed up with Matt Hughes and Ricardo Liborio, to name a few. We have more official tests too. Our products undergo rigorous testing to ensure they meet industry standards. We fill our bags with high-quality material. We firmly believe that the better the equipment you train with, the better your training results will be. You know the importance of having your school’s name and logo on your uniforms. It creates a unified feeling of team spirit and helps promote brand recognition. Take those benefits one step further by branding your bags with your gym’s logo as well! Custom bags make your school look great. They add another element of professionalism to your environment. If you don’t have a logo, Century will help you create one. Just give your Century Customer Service Representative at (800) 626-2787 with any questions!